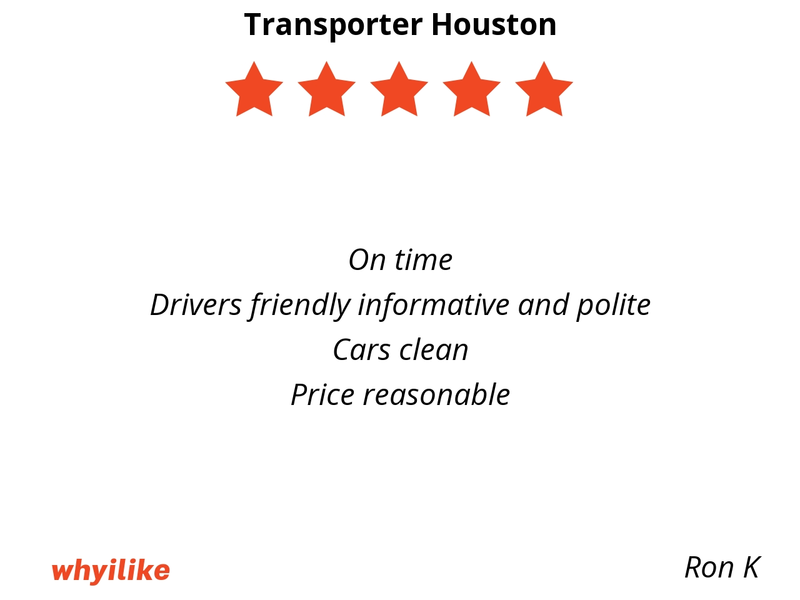 Whether you need citywide private transportation or traveling to the airport for a flight out or coming into Houston, reserve a car by calling us at 832-578-1795. I would like to highly recommended this service as they are very genuine , honest and on time service. 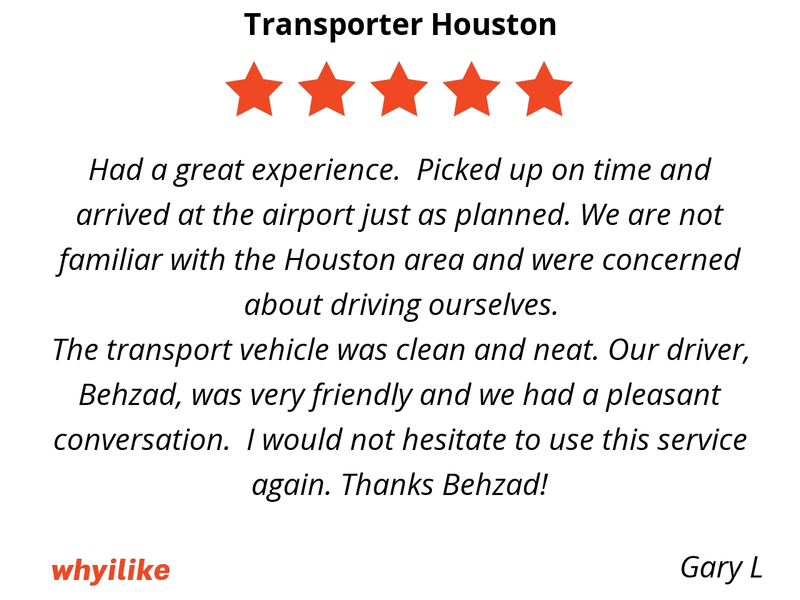 I was travelling to Houston first time and i am not aware whom to book as it was 1 hr far from airport where i need to go from airport..so I ckecked online and found this company.Mr Behzad pick up the call and book my reservation and told that he will be at baggage screening area with my name..I was little bit dougth but when i landed and reached to baggage area he was there with my name and we immediately move out from airport without any hassle. He charged me exactly what they told me. Vehical is nice and clean. Thanks making our first journey good and I will definaly refer my friend , colleague for your taxi service. Excellent driver. Very kind and polite. Good driving skills. Would recommend him to all my friends. Reliable, responsive, prompt, and polite. 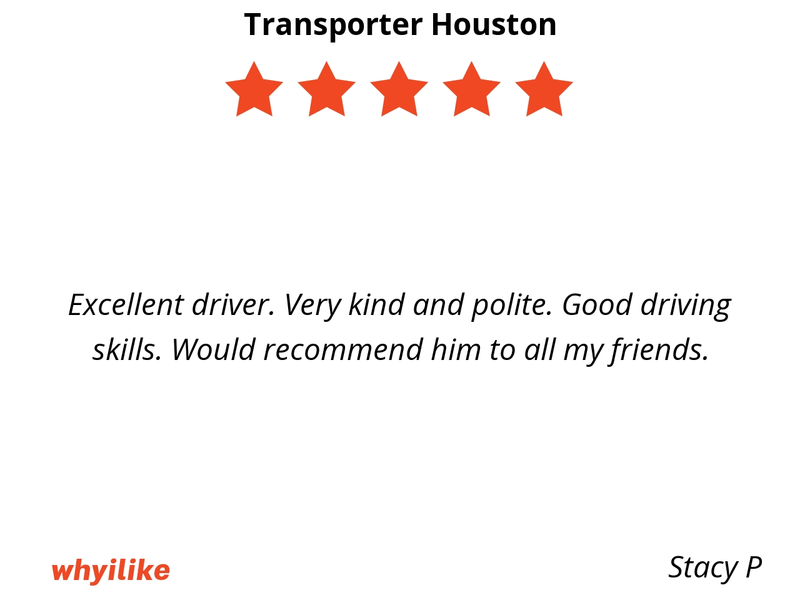 Gentlemen was extremely courteous prompt and an excellent driver. First time customer. 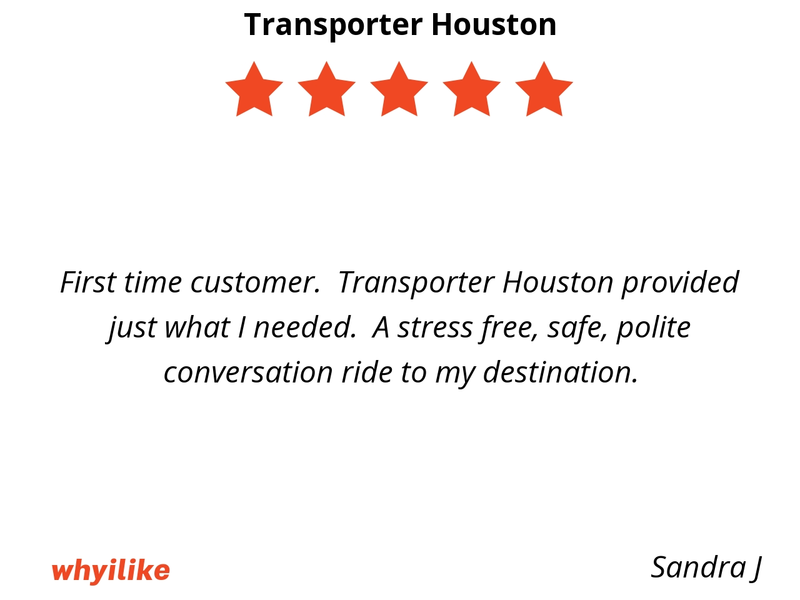 Transporter Houston provided just what I needed. A stress free, safe, polite conversation ride to my destination. Behzad was wonderful. 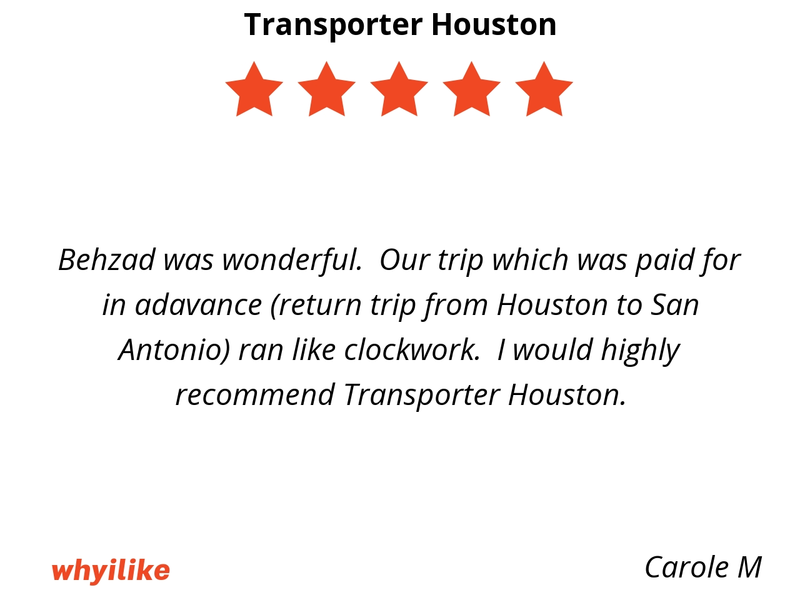 Our trip which was paid for in adavance (return trip from Houston to San Antonio) ran like clockwork. 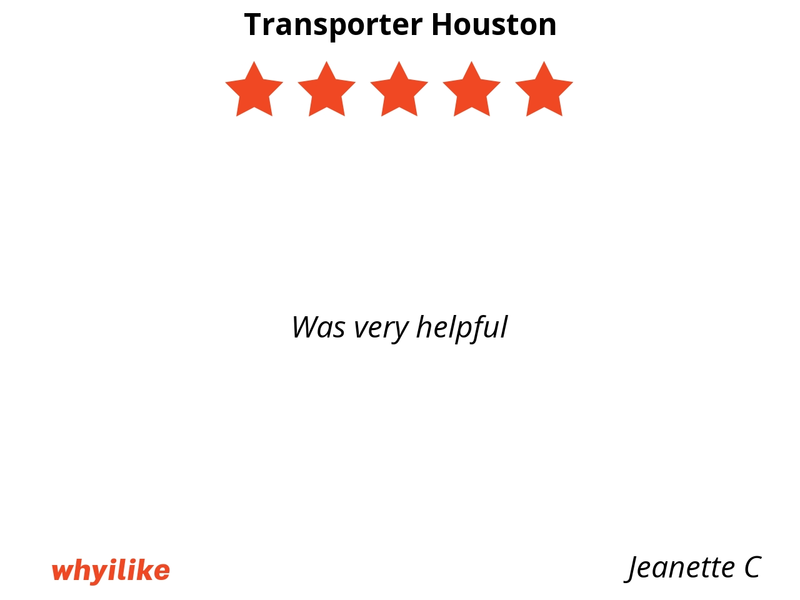 I would highly recommend Transporter Houston. Great great great great great great great great nice kind and thoughtful love the ride. Wonderful service! 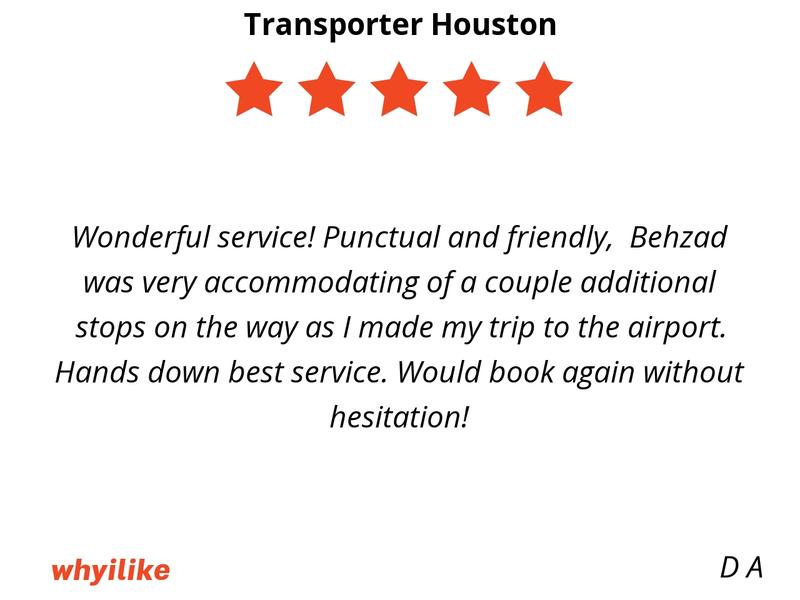 Punctual and friendly, Behzad was very accommodating of a couple additional stops on the way as I made my trip to the airport. Hands down best service. Would book again without hesitation! Driver early. Great car. Great friendly chat and service. 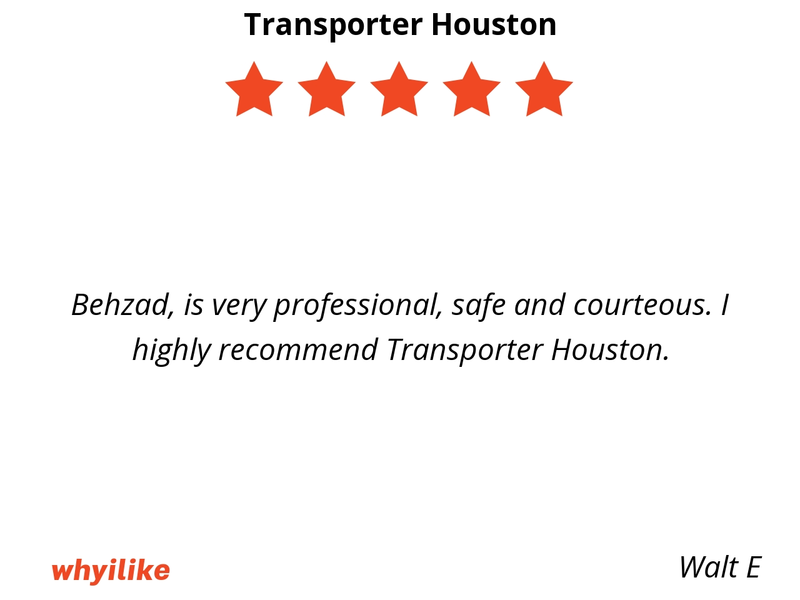 Behzad, is very professional, safe and courteous. 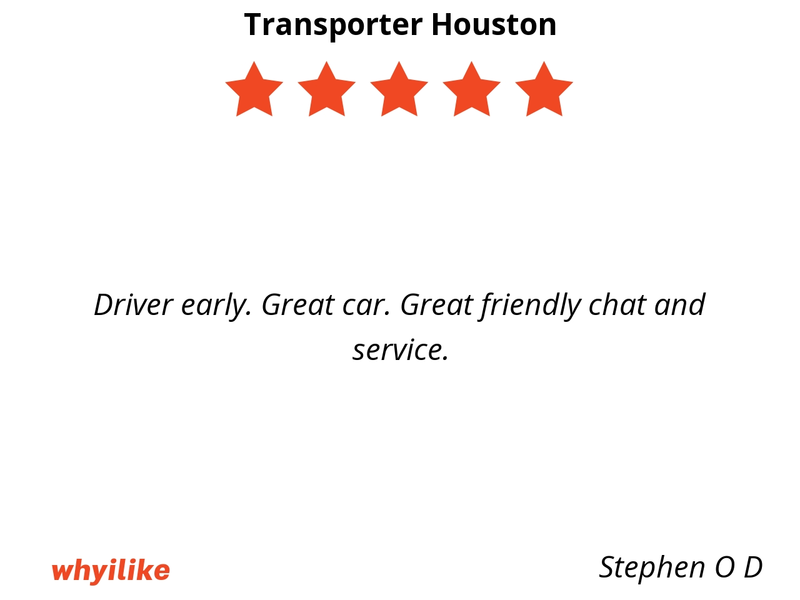 I highly recommend Transporter Houston. 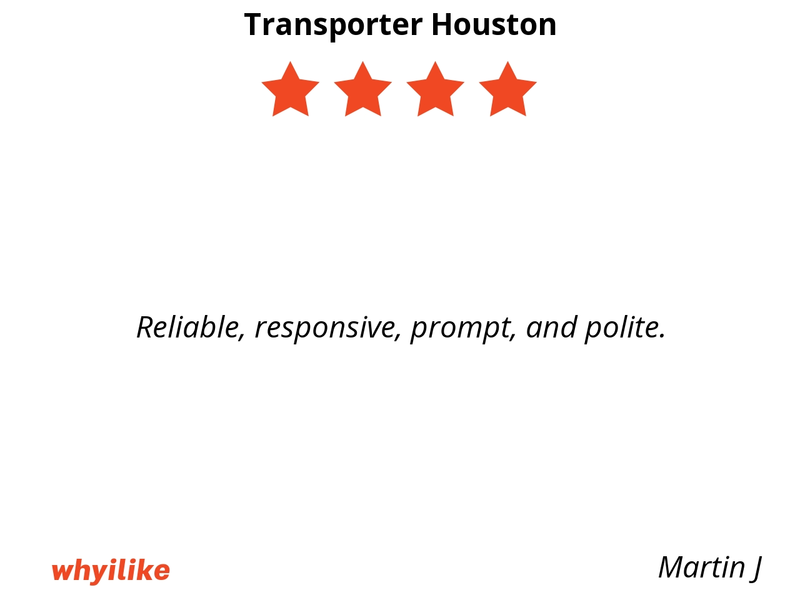 I use transporter Houston for all my airport travel needs. Behzad is very dependable and I can always count on him being there for me. 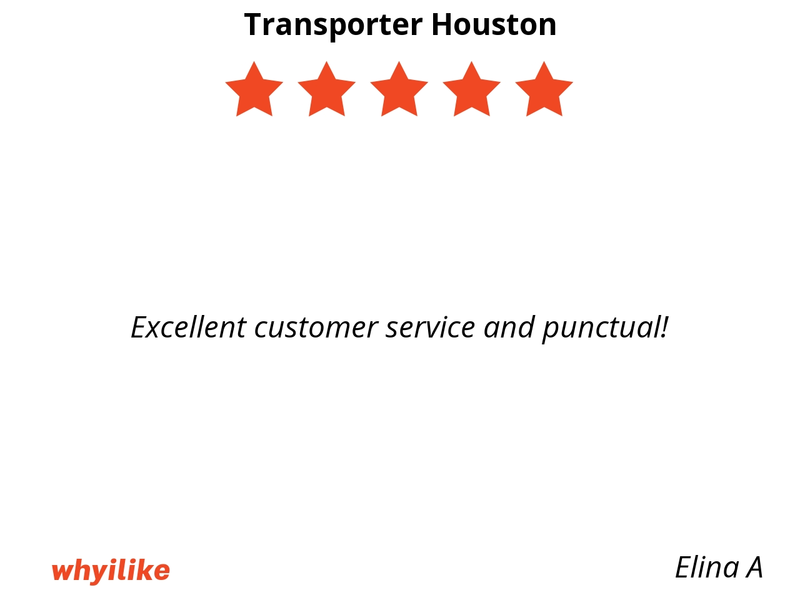 Excellent customer service and punctual! Easy to setup. We used this service for our church group, traveling from out of town. 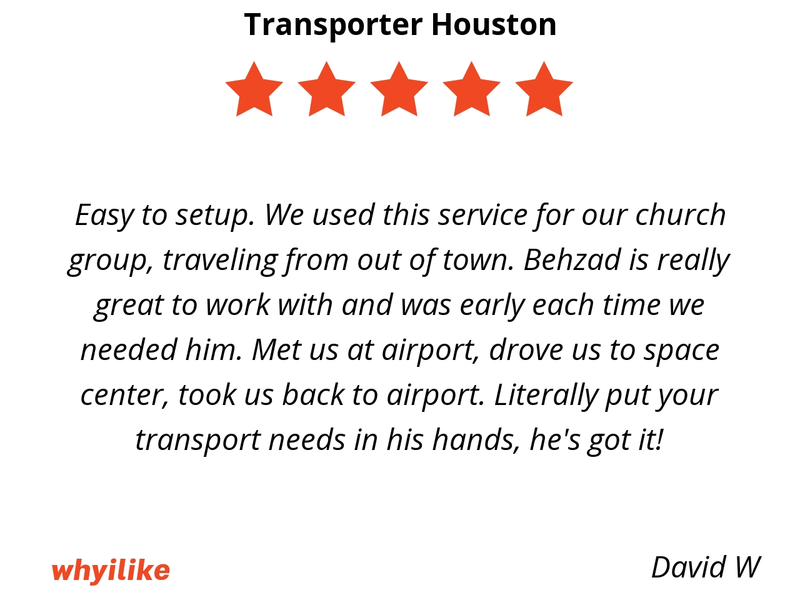 Behzad is really great to work with and was early each time we needed him. Met us at airport, drove us to space center, took us back to airport. Literally put your transport needs in his hands, he's got it! 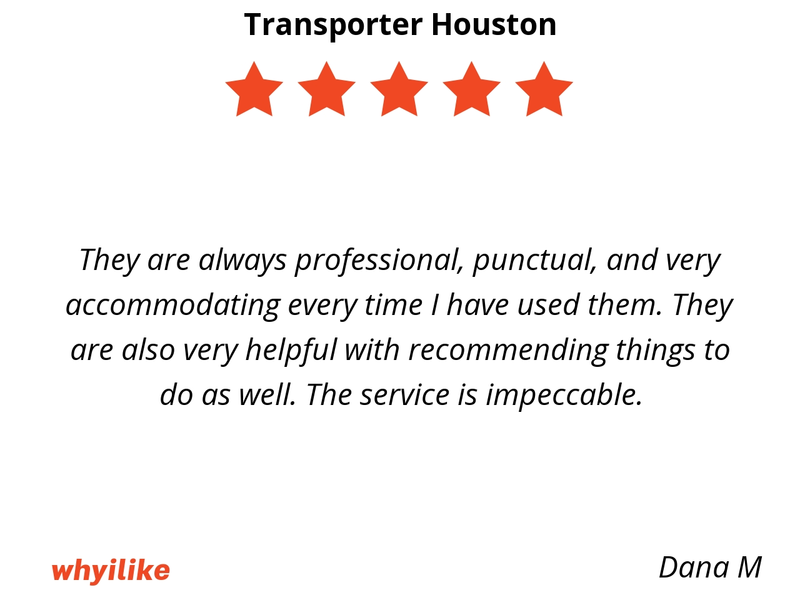 They are always professional, punctual, and very accommodating every time I have used them. They are also very helpful with recommending things to do as well. The service is impeccable. Bhazad was so lovely and accommodating. I booked online to have him meet us at the airport and he was there! This was a huge relief for us having been our first trip to Houston. When we left, I again booked with Bhazad for an early 4am pickup to return to Bush Airport. Again prompt and on time. 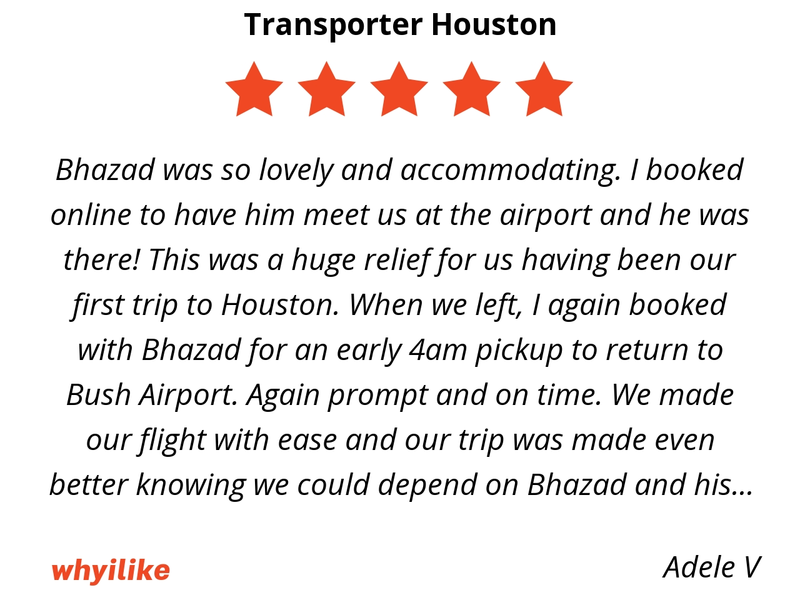 We made our flight with ease and our trip was made even better knowing we could depend on Bhazad and his top knotch and professional service! Had a great experience. Picked up on time and arrived at the airport just as planned. 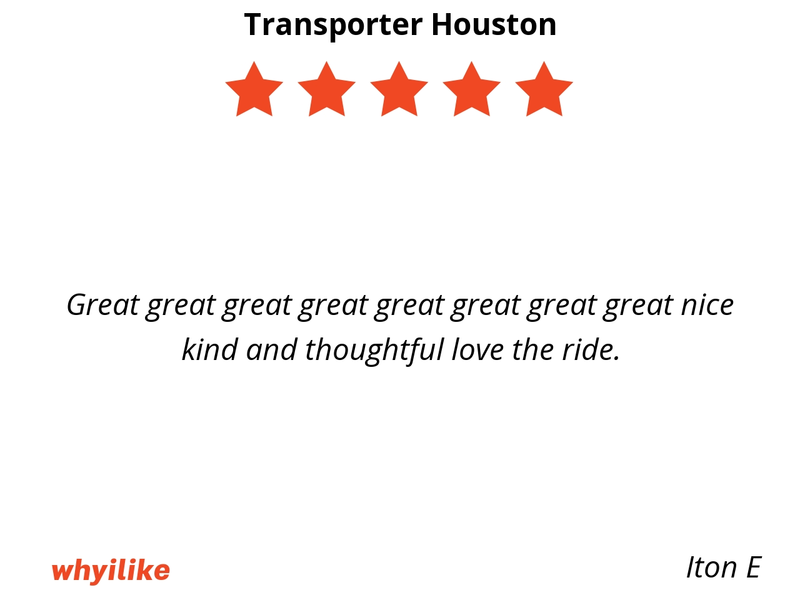 We are not familiar with the Houston area and were concerned about driving ourselves. The transport vehicle was clean and neat. 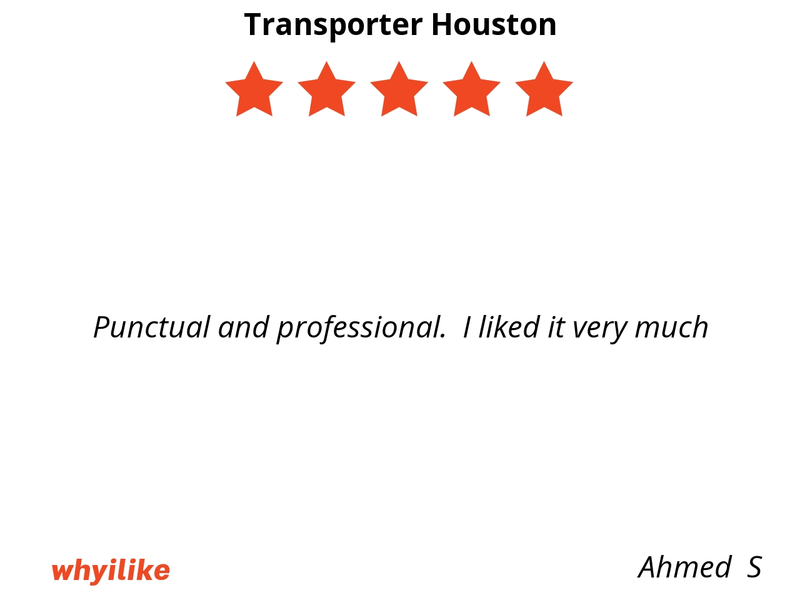 Our driver, Behzad, was very friendly and we had a pleasant conversation. I would not hesitate to use this service again. Thanks Behzad!